As a potential new patient, you're invited to receive a FREE Chiropractic Consultation at the start of your first visit. Dr. Schillinger will ask you questions about your symptoms, your general health, your mental outlook and your lifestyle. This free consultation will help Dr. Schillinger determine if you have a problem that he can help. If, after the consultation, Dr. Schillinger decides you have a condition that he and his staff can help, he'll then perform a thorough examination. This includes a digital posture check, range of motion tests, and orthopedic and neurological tests to determine the root cause of your symptoms. After the exam he'll diagnose the source of your problems and tell you the best courses of treatment to correct them. For more details on what to expect on your first visit and subsequent visits, click here. Smaller health plans, not listed aboce, may still provide coverage, as they are often members of larger health plans to which we belong. Feel free to call us before your first visit to have our staff call your insurance company. This way, we can find out your exact benefits before you come in. Our desire is to help all who need our services, regardless of whether or not you have insurance. 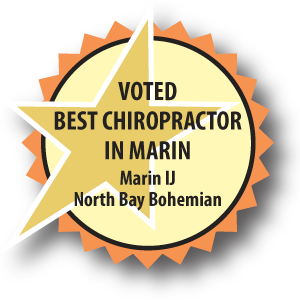 Our office was voted "Best in Marin." One reason is because of our commitment to working out reasonable payment plans which allow our patients to receive chiropractic care, whenever they need it. Before you come in for your free consultation, you're welcome to fill out the new patient intake forms now, and send them to us before you arrive. Since we value your time, handling the forms before your visit decreases your waiting time in the office. Our office is easy to find. We are located just off Highway 101 in San Rafael. Click here for address and directions. We look forward to serving you to so that you can experience better health! In this era of increasing managed care and decreasing personalized care, I assure you that I will take the time to know you, give my best care and instruct you in effective home care strategies. Working together, we will help you achieve total health.